There are still bargains to be had in Ontario housing, but few are near Greater Toronto. 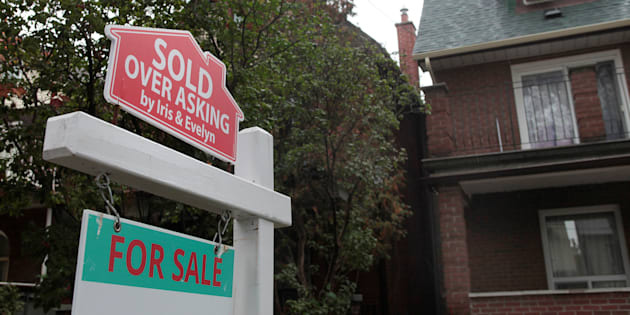 A "sold over asking" sign is on display on a house for sale in Toronto, Oct. 21, 2016. It may regularly make headlines for its high real estate prices, but a new study on Ontario's housing markets shows Toronto isn't the province's least affordable city. A new report from Zoocasa looked at 28 housing markets in Ontario and compared median household incomes to the average housing prices as of August 2018, and assumed a 20-per-cent down payment is made at a mortgage rate of 3.14 per cent with a 30-year amortization. The larger the gap between how much money a household would need to buy a home and the amount a household actually earns, the less affordable that market is. The dubious honour of Ontario's least affordable housing market went to Richmond Hill, a suburb in York Region just north of the city, where you'd need an income of $136,315 to purchase a home at the average price of $999,311. The actual median income of Richmond Hill is $88,353, leaving a gap of $47,962. In Toronto, the median income is much lower at $65,829, but so is the average housing price of $785,223. That leaves a gap of $41,282. The report notes Richmond Hill has a greater proportion of more expensive types of housing, whereas Toronto has more less-expensive options, like condos. When it comes to the province's most affordable markets, the report shows house-hunters need to think outside the Greater Toronto Area. The most affordable market in Ontario is Thunder Bay, which has an average home price of just $227,750. The median income is slightly higher than Toronto, at $66,163, but an income of just $31,067 is needed to buy the average home, leaving a surplus of $35,096. Below are Zoocasa's breakdowns for Ontario's most and least affordable housing markets.